BACKGROUND: Work engagement can be defined as a positive, fulfilling, work-related state of mind that is characterised by Vigour, Dedication and Absorption. There is a general belief that there is a connection between work engagement and business results, as well as total quality. Practitioners and academics have over the years agreed that the consequences of work engagement are positive. Total quality management is an essential practice that can be used to improve the quality of products on a systematic basis to meet customer satisfaction. It is important for an organisation to have engaged employees as it is evident that such an organisation is likely to prosper and attain total quality management (TQM). AIM: The main objective of the study was to determine the effect of work engagement on total quality management practices in a petrochemical organisation. To survive and compete successfully in today's turbulent economic environment, organisations require employees to be proactive, show initiative and remain committed to performing at high standards (Bakker & Leiter 2010:181; Purcell 2014:242). Organisational agility requires employees who exhibit energy and self-confidence and demonstrate genuine enthusiasm and passion for their work (Bakker & Schaufeli 2014). Summing up, modern organisations need an engaged work force. Employees who are engaged want to contribute, have a sense of belonging, defend the organisation, work hard and are not interested in moving to other employers. Employees who are not engaged cause a gap between employees' effort and their organisational effectiveness. This significantly affects an organisation's financial performance (Saks 2017:78). The focus of this research was on the influence of work engagement on total quality management (TQM) practices in the manufacturing facility of a petrochemical organisation. This organisation operates production facilities in South Africa and supplies a range of chemicals to local and international markets. Its competitive advantage lies in its people and its unique technology and products. The manufacturing of good quality products is not only dependent on the technology and operating equipment used, it is also dependent on the operators and effective management of the whole value chain. Managers working in the manufacturing facilities usually face issues on a daily basis that require direct attention and quick response. With production facilities being at the core of business operations, these issues can directly affect the company in substantial ways. There is a high cost due to inconsistencies in quality of the intermediate and final products and this affects the whole value chain, including the relationship with the customers. The pressure on manufacturers to produce high-quality products that are safe is therefore an increasing challenge. Total quality management is an essential practice that can be used to improve the quality of products on a systematic basis to meet customer satisfaction (Karia & Asaari 2006:30). By pursuing TQM, an organisation will improve the quality of its products and reduce rejects and reworks, which will indirectly reduce production costs (Prajogo 2007). Pursuing TQM demands that the organisation controls the production processes to minimise defects in their outputs, and also reduce failure costs. Therefore, the successful implementation of a quality management system yields a number of benefits, such as low production costs and higher productivity attributable to the reduction of rejects and reworks. Another benefit is customer satisfaction leading to customer loyalty and repeat business. According to Biswas and Bhatnagar (2013:27), it is important for an organisation to have engaged employees as it is evident that such an organisation is likely to prosper and attain TQM. The degree to which these employees are engaged is therefore critically important for the implementation of TQM practices and the success of the business. This study's contribution is to show the degree (extent) of employee engagement in the organisation, and the possible link between engagement and TQM practices. This type of study has never been conducted within this particular environment, and as such a valuable contribution could be made to more effective performance management within this context. Another purpose of the study will be to produce managerial recommendations and also produce findings of practical relevance and value for the petrochemical organisations. It became evident from literature that work engagement is defined differently by various organisations and authors. These definitions are in most cases adapted to what the organisations deem important for them. A prominent researcher (Kahn 1990:694) defines work engagement as 'the harnessing of the organisation's members' full selves to their work roles; in engagement, people employ and express themselves physically, cognitively, and emotionally during role performances'. Thus, according to Kahn (1990:693; Kahn & Heapy 2014:164), engagement means to be psychologically present when occupying and performing an organisational role. Other researchers such as Rothbard (2001:656) and Rothbard and Patil (2012:64) also define engagement as psychological presence, but go further to state that it involves two critical components: attention and absorption. Attention refers to 'cognitive availability and the amount of time one spends thinking about a role', while absorption 'means being engrossed in a role and refers to the intensity of one's focus on a role'. In summary, work engagement has been defined as a distinct and unique construct that consists of cognitive, emotional, and behavioural components that are associated with individual role performance. According to Schaufeli et al. (2002), a self-report questionnaire called the Utrecht Work Engagement Scale (UWES) was developed and includes the three constituting aspects of work engagement: Vigour, Dedication and Absorption. Vigour is assessed by the following six items that refer to high levels of energy and resilience, the willingness to invest effort, not being easily fatigued, and persistence in the face of difficulties: (1) At my work, I feel bursting with energy; (2) At my job, I feel strong and vigorous; (3) When I get up in the morning, I feel like going to work; (4) I can continue working for very long periods at a time; (5) At my job, I am very resilient, mentally and (6) At my work I always persevere, even when things do not go well. Those who score high on vigour usually have much energy, zest and stamina when working, whereas those who score low on vigour have less energy, zest and stamina as far as their work is concerned. Dedication is assessed by the following five items that refer to deriving a sense of significance from one's work, feeling enthusiastic and proud about one's job, and feeling inspired and challenged by it: (1) I find the work that I do full of meaning and purpose; (2) I am enthusiastic about my job; (3) My job inspires me; (4) I am proud of the work that I do and (5) To me, my job is challenging. Those who score high on dedication strongly identify with their work because it is experienced as meaningful, inspiring and challenging. Additionally, they usually feel enthusiastic and proud about their work. Those who score low do not identify with their work because they do not experience it to be meaningful, inspiring or challenging; moreover, they feel neither enthusiastic nor proud about their work. Absorption is measured by six items that refer to being totally and happily immersed in one's work and having difficulties detaching oneself from it so that time passes quickly and one forgets everything else that is around: (1) Time flies when I'm working; (2) When I am working, I forget everything else around me; (3) I feel happy when I am working intensely; (4) I am immersed in my work; (5) I get carried away when I'm working and (6) It is difficult to detach myself from my job. Those who score high on absorption feel that they usually are happily engrossed in their work, they feel immersed by their work and have difficulties detaching from it because it carries them away. As a consequence, everything else around is forgotten and time seems to fly. Those who score low on absorption do not feel engrossed or immersed in their work, they neither have difficulties detaching from it, nor do they forget everything around them, including time. A study by Bakker (2013) and recently by Tauetsile (2016) found using t-tests and ANOVA that there were some minor group differences in age, gender and ethnicity in relation to the levels of work engagement. However, the study found significant differences in groups for education level, job position and tenure. Firstly, employees who had a certificate or diploma significantly differed from those with a degree in terms of their engagement level. Those with a degree seemed to have a higher engagement level. Secondly, top management seemed to be more engaged than the executive level. Thirdly, in terms of tenure, it seemed that employees who had worked for less than 5 years were more engaged than those who had worked in the organisation for between 8 and 10 years. Individuals who are fairly new to the organisation may find their job more interesting and challenging, and thus be more engaged than those who have been in the company longer (Bakker 2013). Below is a discussion of quality and total quality management. There is much published work on quality as a performance measure in the manufacturing industry (Kazemkhanlou & Ahadi 2014). Quality is most often defined as the ability of a product or service to consistently meet or exceed customer expectations (Evans 2013). Lillrank (2002:691) classifies quality definitions found in the literature to be divided into four categories: excellence, value for money, conformity to requirements and meeting or exceeding customer requirements. Lillrank (2002) further emphasises that excellence-based definitions include the idea that products or services may include elements that are perceived as superior, which are often very subjective, hard to measure and which confuse quality with product segments or grades. The most widely used definitions from the American Society for Quality and more recently ISO 9000 - 2000, are based on customer satisfaction, which may be achieved, not only through conformance to requirements, but through some inherent characteristics of the product or service, and the way it is presented and delivered to the customers (Barnes 2009). The importance of quality as an objective is now widely recognised throughout the world. As a result of increasing customer demands and the removal of barriers of trade, inefficient suppliers or suppliers of low quality goods or services will find it difficult to survive (Kazemkhanlou & Ahadi 2014). Total quality management (TQM) as defined by Mohrman et al. (1995:26) is an approach to managing organisations, which emphasis the continuous improvement of quality and customer satisfaction. It entails the application of systematic tools and approaches for managing organisational processes with these ends in mind (continuous improvement of quality and customer satisfaction), and involves the establishment of structures such as quality improvement teams for maintaining focus and enacting organisational improvement processes (Liao, Chang & Wu 2010). The T-component of TQM: TQM implies a total, company-wide commitment to quality and calls for everyone, including suppliers, to be responsible for quality and involved in all the efforts to maintain or upgrade their work. The Q-component of TQM: The major goal of quality management is to meet and exceed customer expectations. Internal customers are as important as external customers. Continuous improvement should be integrated into the management of all systems and processes. Effective training should also teach and empower all employees to understand and solve quality related problems. The M-component of TQM: The broad nature of TQM efforts requires commitment of top management to the process. Top management is responsible for creating clear and visible values and to integrate these values into strategic business plans. TQM requires that all employees are to be involved and, as a result, it is important to re-shape the organisational culture that supports it. Research was conducted by Zhang, Waszink and Wijngaard (2000) to develop an instrument to measure TQM implementation in the manufacturing industry in China. 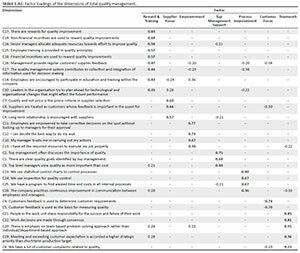 Based on the comprehensive review of the TQM literature, the following constructs were considered to be the TQM practices (what an organisation does to demonstrate its commitment to TQM): leadership commitment, supplier quality management, vision and plan statement, evaluation, process control and improvement, product design, quality system improvement, employee involvement and empowerment, recognition and reward, education and training, and customer focus. According to Karia and Asaari (2006:30), TQM practices are a set of practical measures such as: continuous improvement, meeting customer requirements, reducing re-work, long-range thinking, increased employee involvement and teamwork, process re-design, competitive benchmarking, team-based problem-solving, continuous monitoring of results and closer relationship with suppliers. The above involves the combined efforts of all members of the organisation - from senior management to shop-floor employees. Mohrman et al. (1995:26) emphasise that the key to TQM is the definition of quality as meeting customer requirements, and a belief that the organisational capability to deliver quality is enhanced by continuously improving the capacity of the work processes of the organisation to deliver value to customers. TQM has been widely implemented throughout the world. Many firms have arrived at the conclusion that effective TQM implementation can improve their competitive abilities and provide strategic advantages in the marketplace (Snee 2016). Several studies have shown that the adoption of TQM practices enable firms to compete globally (Allen & Kilimann 2001:110). Total quality has developed to what it is today along with other business management philosophies. It is a diversified way to see the growth of the whole business. TQM posits certain numerical and non-numerical goals for a company. Reaching these goals is typically not easy. It requires support from management, long-term strategic decision-making and motivated personnel (Garvin 1988:319). In general, product or service quality measures are essential to find out information that is important to customers about each product or service. This information can help to drive the new product design process, which fits the customers' requirements (Snee 2016). Moreover, measuring product and service quality is identifying information on what customers want, as well as what dimensions of products or services need to be measured and controlled. Studies continue to look at the antecedents and consequences of work engagement. It is understandable that organisations wish to increase work engagement, given that engaged employees are willing to make use of their full potential in their work roles in a positive way (Kahn 1990:694), have better well-being (Hallberg & Schaufeli 2006:120), are more productive and remain in their jobs for longer (Saks 2006:602; Schaufeli & Bakker 2004:293). Many researchers have tried to identify factors leading to work engagement and develop models to draw implications for managers. Their diagnosis aims to determine the drivers that will increase work engagement level. Three antecedent conditions of psychological meaningfulness, availability and safety which provide opportunities for intervention to increase levels of engagement were proposed by Kahn (1990:694). Psychological meaningfulness is influenced by work characteristics, such as challenge and autonomy (Bakker & Demerouti 2007:310). Psychological availability depends on individuals having sufficient psychological and physical resources, such as self-confidence, to invest in their role performances (Hallberg & Schaufeli 2006:121). Psychological safety stems from the organisational social systems, with consistent and supportive co-worker interactions and organisational norms, allowing for greater engagement (Bakker & Xanthopoulou 2009:157). This third antecedent condition, psychological safety, offers the most potential for leadership to influence engagement. Specifically, leadership that provides a supportive, trusting environment allows employees to fully invest their energies into their work roles. Kahn (1990:694) established theoretical and initial empirical evidence for a link between supportive leadership and work engagement. In a study by Blessing (2008), it was found that almost 60% of surveyed employees want more opportunities to grow forward to remain satisfied in their jobs. A strong manager-employee relationship is a crucial ingredient in the work engagement and retention formula. provide support and recognition where appropriate. After surveying 10 000 NHS employees in Great Britain, the Institute of Employment Studies (Robinson, Perriman & Hayday 2004) points out that the key driver of work engagement is a sense of feeling valued and involved, which has the components such as involvement in decision making, the extent to which employees feel able to voice their ideas, the opportunities employees have to develop their jobs and the extent to which the organisation is concerned for employees' health and well-being. In his study, Yen (2003:257) found that work engagement is a necessary predecessor for successful TQM. A study by Biswas and Bhatnagar (2013:27) found a positive relationship between aspects of work engagement and TQM practices in an organisation. It is therefore important for an organisation to have engaged employees, as it is evident that such an organisation is likely to prosper and attain TQM. In turn, this will result in an increase in returns and earnings (Chung et al. 2015:72). Therefore, the literature suggests that it is important for workers to be engaged in order to achieve TQM. Greater outcomes of an organisation, such as organisational practices and quality products and services, as well as customer satisfaction that make up TQM can be derived from committed and engaged employees (Biswas & Bhatnagar 2013). The Gallup Organisation (2004) also found critical links between work engagement and customer loyalty, which is also one of the aspects of TQM. They compared the scores of these variables among a sample of stores scoring in the top 25% on work engagement and customer loyalty with those in the bottom 25%. Stores in the bottom 25% significantly under-performed across three productivity measures: sales, customer complaints and turnover. Gallup cites numerous similar examples. The International Survey Research (ISR) team has similarly found encouraging evidence that organisations can only reach their full potential through emotionally engaging employees and customers (ISR 2004). While this research does not show investors and business leaders exactly what organisations are doing on a day-to-day basis to develop engaged employees, the findings do demonstrate differences in overall performance between companies, and Gallup's meta-analyses present strong evidence that highly engaged work groups within companies out-perform groups with lower work engagement levels, and the recent findings reinforce these conclusions at the workgroup level. The meta-analysis study shows that top quartile business units have 12% higher customer advocacy, 18% higher productivity and 12% higher profitability than bottom-quartile business units. In contrast, bottom-quartile business units experience 31% - 51% more employee turnover than those in the top quartile of workplace engagement. This research into earnings per share provides a degree of proof that work engagement correlates to crucial business outcomes. The maintaining of quality at expected levels in an organisation is usually challenging. The number of product recall cases is growing each day. Poor quality products cause business disruption, financial loss, costly lawsuits and long-lasting damage to the brand and corporate image of organisation. A brand or even the organisation's reputation can be damaged irreparably. Engaging the employees of the petrochemical organisation is important as this sector forms a significant part of a country's economic system, especially in the supply of fuels and chemicals. Having employees that are engaged means they will work alongside the organisation to achieve its goals and objectives and they can provide the organisation with a competitive advantage. Thus, by engaging their employees they can improve levels of productivity, job satisfaction, motivation and commitment, and reduce turnover rates. Current research appears to fail in measuring the extent to which work engagement is related to TQM practices to reduce cost of poor quality. There is also a dearth of literature about the extent of work engagement according to the biographical profile of the participants in this type of industry and environment. There is still a void in academia and in practice about the effect of work engagement, which is an element of organisational behaviour on the quality performance of the organisation, which is an element of operations management. There is a need to establish how the human-related issues can be translated into measurable business results, and also on the impact of these human variables on the management of the organisations. It was also important to determine if there are differences in levels of engagement as found by other researchers. H1: Statistically and practically significant positive relationship exists between work engagement and TQM practices. The research objectives are divided into primary and secondary objectives. The primary objective of this study is to investigate the extent of work engagement and the possible impact it has on the total quality management practices used in the petrochemical organisation. The empirical research used to achieve the objectives of this study is based on a descriptive research approach. This type of research is used when there is a clear statement of the research problem and detailed information needs (Bhattacherjee 2012). Saunders, Lewis and Thornhill (2012) indicate that such formalised studies are used to achieve research objectives that involve characteristics associated with a subject population, estimates of the proportions of a population that have these characteristics and the discovery of associations among different variables. The survey is a positivist research design in which a selected sample is studied to make inferences about the rest of the population (Saunders et al. 2012). Surveys typically use questionnaires and interviews in order to determine the opinions, attitudes, preferences and perceptions of persons of interest to the researcher. A survey design is used in this case. It was identified as relevant to study the influence of work engagement on the TQM practices in a petrochemical organisation. According to Barbie and Mouton (2015), the research methods used in this type of research design are structured and quantitative in nature. In view of the above considerations, the quantitative approach was opted for as the most suitable for the purposes of this research. A research population is a group that the researcher wants to generalise from and the sample is the group of people that are selected to be in the study (Bhattacherjee 2012). The targeted population for this study was the employees of a South African petrochemical organisation. The company has about 583 employees. Workers from all levels, ranging from professional to skilled, were included in the study population. Random sampling was used to send the questionnaires to 200 employees. Randomisation of the probability sample means selecting a sample from the whole population in such a way that the characteristics of each unit of the sample approximate the characteristics of the whole sample (Saunders et al. 2012). The sampling technique used for this study was therefore probability sampling. A list of all employees was received from the Human Resource (HR) department of the company. A consecutive number was assigned to each of the employees from 1 to 583. A computer program (Excel random generator) was then used to generate a list of random numbers from which a sample of 200 employees was randomly drawn out of a population of 583. An email was sent to the selected employees to participate in the research. Hard copies of the questionnaires were also distributed to those who have no access to email. The objectives and nature of the research were explained, as well as the different constructs. The questionnaires were conducted anonymously, requiring the people to respond either directly by email or indirectly by means of the boxes placed in the control rooms for the hard copies. Timelines were indicated on the questionnaires and agreed upon. Voluntary participation was highlighted and participants were thanked for their involvement. A total of 166 questionnaires were received. Two standardised questionnaires were used in the empirical study. A biographical questionnaire, regarding participants' age, gender, race, education and years employed, was also included in the measuring battery. The first questionnaire was the UWES, which was used to measure the levels of work engagement of the participants (Schaufeli et al. 2002). According to the authors, the UWES includes three dimensions, namely Vigour, Dedication and Absorption. The questionnaire consists of 17 questions. Storm (2002) obtained the following alpha coefficients for the UWES in a sample of 2396 members of the South African Police Service: Vigour 0.78; Dedication 0.89; Absorption 0.78. The questions are discussed and shown in section 2.1.1. The second questionnaire was based on TQM. It was adopted from Zhang et al. (2000), based on variables which include top management commitment, employee involvement, continuous improvement, employee empowerment, customer focus and satisfaction. The instrument was tested on, and validated by 212 Chinese manufacturing companies. The overall values of Cronbach's alpha for independent variables were above 0.8, which means that the constructs were reliable. Toga (2017) also obtained Cronbach's alphas above 0.75 using a sample of participants in the South African foundry industry. Employee involvement and empowerment are analysed to determine if the concept of TQM is embraced. In order for the company to meet customers' changing needs, it is important to have continuous improvement, which is a pivotal aspect of TQM. Because there is no business without customers, customer focus and satisfaction are also measured. A five-point Likert scale is used as a measuring system throughout, with the following scores: not satisfactory: (1), somewhat satisfactory (2), unsure (3), satisfactory (4) and very satisfactory (5). The use of the interval scaling method enables the use of traditional statistical analyses methods, which are discussed below. In this study the data were captured and analysed using the SPSS and STATISTICA statistical programs. Exploratory factor analysis (EFA) was used to examine constructed equivalence and to enhance the reliability results of both the UWES and the TQM. The reason why EFA was used as opposed to confirmatory factor analysis (CFA), was because of the small number of participants (N = 166). Hoelter (1983:325) recommends that a minimum of 200 participants should be included before carrying out CFA; hence, EFA was employed in this study. The number of factors in the total sample of the UWES and TQM was determined by the principal component analysis. Subsequently components extraction was used to estimate the number of factors followed by principal axis factoring extraction using a rotation method of direct Oblimin with Kaiser normalisation or Varimax on the UWES and TQM. Cronbach's alpha coefficients were used to determine the internal consistency of both instruments (the UWES and TQM). Pearson product-moment correlation coefficients were used to specify the relationship between the variables. In terms of statistical significance, the correlation is practically significant at p ≤ 0.05. Effect sizes (Cohen 1988:15) were used to decide on the practical significance of the findings. A cut-off point of 0.30 (medium effect) and 0.50 (large effect) are set for practical significance of correlation coefficients. T-tests and analysis of variance (ANOVA) were employed to determine differences between the groups in the sample. Effect size (Cohen 1988:15; Steyn 1999:12) was used in addition to statistical significance to determine the importance of relationships. Effect sizes served to indicate whether the results obtained were practically significant. Ethical approval was given by North-West University (NWU) as part of a dissertation for Master of Business Administration (MBA). A total of 166 questionnaires were received representing a response rate of 83%. Table 1 represents a numeric dispersion of the sample. The sample consists of 166 respondents with 126 men (75.9%) representing the majority of the sample and 40 (24.1%) women comprising the minority of the sample. Regarding age, the largest group was 85 (51.2% of the sample) who indicated that they are between 31 and 40 years of age. The second largest group was 42 (25.3%) respondents who indicated that they are between the ages of 41 and 59 years. The 37 (22.3%) respondents in the third largest group are between the ages of 21 and 30 years. There was only one person below 20 years and only one person above 60 years. Regarding their race, the largest group was those 88 (53%) respondents who indicated that they are black respondents. The second largest group (38.6%) were white respondents while the Indian- and mixed race respondents were 4.2% and 3.6%. The majority of respondents were middle managers (50.0%), followed by junior employees (37.7%) and senior management (13.9%). There was only one respondent in top management. Regarding qualification, the majority (50.6%) of the respondents have either a diploma or a degree, followed by those who only have matric. 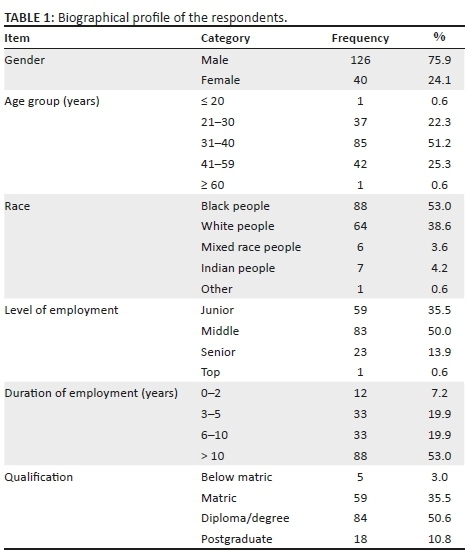 A total of 10.8% of the respondents have a postgraduate qualification, while the minority (3%) do not have matric. 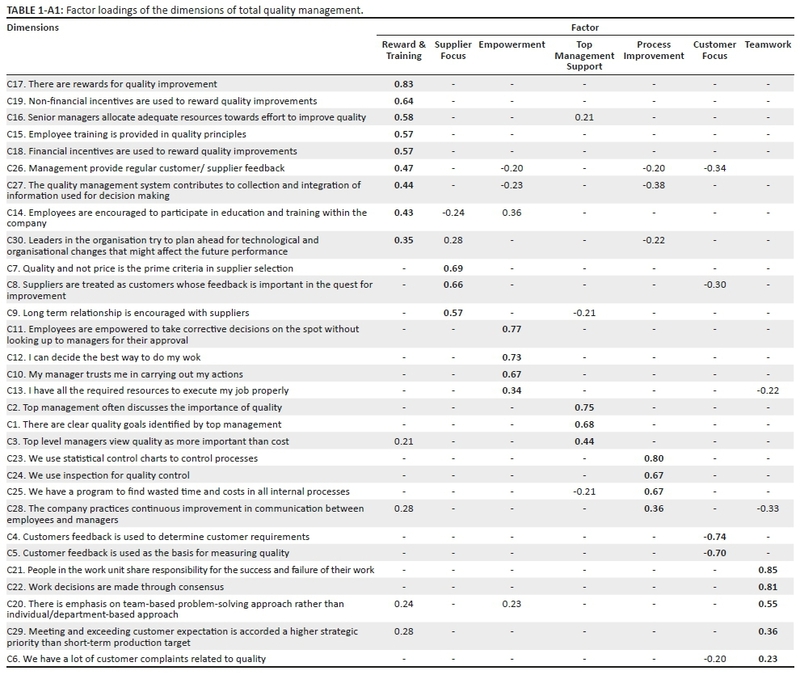 The general aim of the study was to determine the effect of work engagement on the total quality management practices in the petrochemical organisation. To achieve the general objective, specific objectives were determined and analysed through statistical properties of the two measuring instruments (UWES and TQM), namely to determine their construct validity, reliability, as well as the correlation between the instruments, and to determine the demographic differences between groups in the experience of engagement and TQM principles. To answer the first objective of the study with regard to the conceptualisation of engagement and TQM, from the literature review, it came out that organisations wish to increase work engagement, given that engaged employees are willing to make use of their full potential in their work roles in a positive way (Kahn 1990:694), have better well-being (Hallberg & Schaufeli 2006:120), are more productive and remain in their jobs for longer (Saks 2006:602; Schaufeli & Bakker 2004:293). Mohrman et al. (1995:26) emphasise that the key to TQM is the definition of quality as meeting customer requirements, and a belief that the organisational capability to deliver quality is enhanced by continuously improving the capacity of the work processes of the organisation to deliver value to customers. The Gallup Organisation (2004) found critical links between work engagement, customer loyalty, business growth and profitability. Yen (2003:257) found that work engagement is a necessary predecessor for a successful TQM. The second objective of this study was to determine the factor structure and internal consistency of the UWES. The results of this study revealed that engagement is a two-factor model after the principle factor extraction was done. All the items are loaded in total on Factor 1 (labelled Vigour-Dedication) and Factor 2 (labelled Absorption) as shown in Table 2. This two-factor model explained 59% of the total variance. However, in a study by Coetzer and Rothmann (2007), they found an acceptable fit for purpose statistics for the three-dimensional structure of the UWES for employees in an insurance company. Storm and Rothmann (2003a) and Naudé (2003) established that there are high correlations between work engagement dimensions (Vigour-Dedication and Absorption) by which they suggested that work engagement as measured by the UWES is a two-factor construct. Therefore, the results of this study also confirm that the UWES can be a two-factor construct. The Cronbach's alpha coefficients showed acceptable internal consistency for both dimensions (0.92 for Vigour-Dedication and 0.88 for Absorption), which is above the guideline as prescribed by Nunnally and Bernstein (1994). It can therefore be concluded that the UWES as utilised in this research is a valid and reliable measuring instrument. The new sub-scale scores were calculated using the mean score on the items per factor. Results are presented in Table 3. To answer the third objective, EFA was conducted on the TQM and the results revealed that the questionnaire has a seven-factor structure with all the items loading on those factors explaining 68% of the total variance as shown in Table 1-A1 in the appendix. Antony et al. (2002) also identified seven critical factors for TQM. The reliability coefficients for their results ranged from 0.62 to 0.95. The reliabilities of six of the factors identified in this study ranged from 0.75 to 0.88, as shown in Table 4, indicating strong reliability. The factor with a value of 0.65 was also retained as it is also deemed acceptable in social sciences (Field 2009:675). It can therefore be concluded that the TQM questionnaire as utilised in this research is a valid and reliable measuring instrument. Factor loadings are shown in Table 5. The sub-scale scores were calculated, using the mean score on the items per factor. Results are presented in Table 5. The fourth objective was to determine the relationship between dimensions of engagement and TQM constructs. The results indicated a strong positive statistical and practical correlation between Vigour-Dedication and Absorption as dimensions of the UWES scale. Previous studies by Storm (2002) indicated a similar outcome of high correlations between work engagement dimensions of Vigour, Dedication and Absorption. 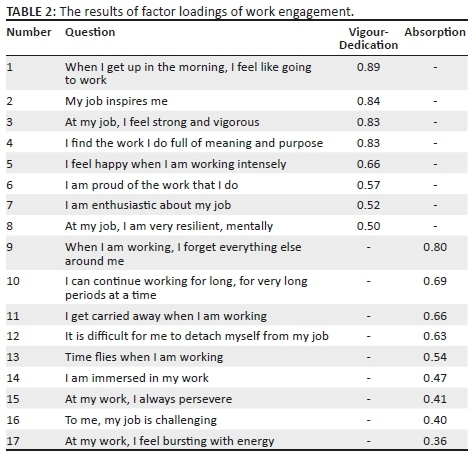 This correlation suggests that energetic and dedicated employees are highly likely to be happy in their work to the extent that they are unlikely to detach themselves from their work. The results of the product-moment correlation coefficients between the constructs are shown in Table 6. Reward and Training dimension is positively correlated to Vigour-Dedication as well as Absorption (practically significant, medium effect). Supplier Focus is positively correlated to Vigour-Dedication and Absorption (practically significant, medium effect). Empowerment is positively correlated to Vigour-Dedication as well as Absorption (practically significant, large effect). Top Management Support relates positively to Vigour-Dedication and Absorption (practically significant, medium effect). Process Improvement shows a statistically significant, positive relationship with Vigour-Dedication (practically significant, medium effect), but it does not meet the cut-off point of 0.3 that was set for practical significance when related to Absorption. Customer Focus had a weak correlation with the two dimensions of engagement with values below 0.3. Teamwork is positively correlated to both Vigour-Dedication and Absorption (practically significant, medium effect). Based on these results, the hypothesis has been successfully met. The results are also in agreement with the findings by Biswas and Bhatnagar (2013) that there is a significant positive relationship between work engagement and TQM practice. Gender: Women were more engaged in terms of Absorption, but had similar level of engagement in terms of Vigour-Dedication. A t-test was conducted to test whether men and women responded differently to the sections. From the p-values obtained for gender, it was concluded that for Absorption the p-value was smaller than 0.05, indicating that the participants answered the questions in a significantly different manner statistically. For the other dimensions, the p-values were greater than 0.05 indicating that the participants answered the questions in a significantly similar manner statistically. The effect size for Absorption had a d-value of 0.426. This d-value is closer to the practically visible difference value and can be considered practically visible. Age group: Employees aged in the 41-59 category were slightly more engaged than the other groups. The p-values for Absorption and Teamwork were both below 0.05 indicating that there was a statistically significant difference in the way the different age groups responded to the questions. This was confirmed by the ANOVA results for the two dimensions. The results for the effect sizes indicate that for Absorption, the d-values were 0.54 and 0.50 for the age groups 21-30 and 31-40 when compared to the 41-49 age groups. This indicates a medium practically visible difference. In the case of Teamwork a medium practically visible difference was seen between the 31-40 and 41-59 age groups. For all the other dimensions with p-values above 0.05, there were no significant differences in the responses by different age groups. Race: The mixed race group came out as the most engaged, followed by the Indian participants while the black employees were the least engaged. According to the p-values and the ANOVA results, a significant difference was only noticeable on the dimension of Absorption. Level of employment: Employees in the middle and senior management levels were the most engaged. Junior employees were the least engaged. The p-values for Vigour-Dedication, Absorption and Top Management Support were all below 0.05 indicating a significant difference in the way different levels of employment responded. This was confirmed by the ANOVA results. The effect sizes indicate that there were some medium practically visible differences in the way the various levels responded to the three dimensions. · Duration of employment: Employees with 0-2 years' experience were the most engaged, while the level of engagement was similar for the rest of the employees. According to the p-value of 0.03 and the ANOVA results, a significant difference was only observed for the dimension of Teamwork. Qualification: Employees who had no matric qualification were the most engaged. The p-values and ANOVA results indicated that significant differences were only observed for the responses to Reward and Training, Supplier Focus and Customer Focus with respect to qualifications. This study has shown that the use of the UWES is still acceptable for measuring engagement of employees in a petrochemical industry because of its construct validity and high level of reliability. The use of the TQM questionnaire was also suitable because of its construct validity and high level of reliability. The results confirm that there is a practical, significant, positive relationship between work engagement and TQM practices. Research has shown that there is a link between levels of engagement and TQM. Human resource practices that have a strong focus on people have demonstrated a significant impact on improvements in productivity, satisfaction and financial performance. In addition, engagement needs to be viewed as a broad organisational strategy that involves all levels of the organisation: a string of actions and steps, which requires the contribution and involvement of organisational members, as well as consistent, continuous and clear communication. Companies with engaged employees have higher employee retention because of reduced turnover and reduced intention to leave the company. They also have higher productivity, profitability, growth and customer satisfaction. For managers, the work on work engagement starts at day one through an effective recruitment and orientation programme; the work on work engagement begins from the top, as it is unthinkable to have engaged people in the organisations where there is no engaged leadership. Managers should enhance two-way communication, ensure that employees have all the resources they need to do their job, give appropriate training to increase their knowledge and skill, establish reward mechanisms in which good job performance is rewarded through various financial and non-financial incentives, build a distinctive corporate culture that encourages hard work and keeps success stories alive, develop a strong performance management system which holds managers and employees accountable for the behaviour they bring to the workplace, place focus on top-performing employees to reduce their turnover and maintain or increase business performance. Quality management originated from two ideas about how to run organisations better. The first idea revolved around customers. If the organisation can determine what its customers like, they can deliver it the same way every time. Customers will come back to purchase such products and services, and will also tell others about these products and services. The second idea the organisation needs to explore is efficiency. If the organisation can figure out the most efficient way to produce a product or service and stop wasting time and materials, replacing poor quality goods or delivering unsatisfactory services, then it will be more successful. Management-led processes should be enhanced within the organisation to obtain the involvement of all employees, in the continuous improvement of the performance of all activities, as part of the normal business to meet the needs and satisfaction of both the internal and external customers. To continue to be at the leading edge, the organisation must continually analyse and systematically improve their business processes measures. Therefore, attention must be given to continuous process improvement to meet the customers' requirements and increase market share. Training and development of employees is required to ensure competent people in the long run. It is important to communicate with everyone in the organisation; empowerment and delegation are largely about giving each employee a sense of responsibility for manufacturing a product or for performing a service to satisfy customers. This study has some limitations. The cross-sectional survey design allows for the identification of the existence of relationships between variables, but implies that more complicated forms of infrequent connections could not be examined. Prospective longitudinal and quasi-experimental research designs are needed to further validate the interpreted relationships within this study. There was a low number of participants and the use of the participants within a single organisation, which limit the generalisations that could be made to the whole petrochemical industry. In spite of the noted limitations, the findings offer valuable suggestions for future research. The findings obtained in this study can be replicated with larger sample groups in order to draw conclusions about the factor structure of the UWES and TQM in the South African context. It is recommended that larger samples be utilised to enable generalisation of the findings to other similar groups in the petrochemical industry. Longitudinal research is recommended to establish levels of engagement and total quality management over a period of time. Participants in different demographic groups experienced different levels of engagement. Possible reasons for this should be established by further research. Evidence suggests that new employees score the highest on levels of engagement, which may in part be due to the optimism and enthusiasm they experience upon starting a new job. Further research is needed to determine exactly which attitudes they possess at this stage and what elements they are so highly engaged with in their work. Once these have been identified, managers can attempt to maintain that high level of engagement employees' experience at the beginning of their employment throughout their entire period of employment by understanding clearly what predicts engagement for those individuals. One of the main objectives was to determine the relationship between the dimensions of engagement and TQM. Overall, the results indicate that work engagement has a positive relationship with the dimensions of TQM, which is used as a measure of quality, a non-financial measure of performance. This finding is in agreement with the conclusions drawn by practitioners and academics that the consequences of work engagement are positive. Significant differences were found between the various demographic groups and their scores on engagement. This was taken from a dissertation that was used as partial fulfilment of a master's qualification at North-West University. I thank NWU for the support and the opportunity. The author declares that they have no financial or personal relationships that may have inappropriately influenced them in writing this article. D.H.B. wrote the article and M.M.H. assisted with the review and proofreading.